We have a plethora of data available from tooling within the DevOps space, it is about time we used it! 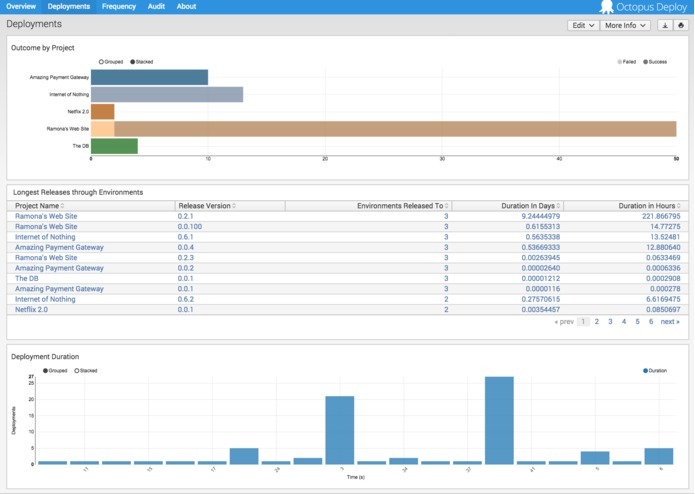 The Octopus Deploy App for Splunk provides a modular input to ingest data from an Octopus Deploy instance, and a set of dashboards and views to analyse the data. The app is available from https://github.com/merbla/splunk-octopusdeploy-app/. This application is entering into the Innovation category of the contest. The app file is octopus_deploy.tar.gz. The app is portable and has been tested on Linux, OSX & Windows. The application is comprised of two main areas, the modular input and a set of dashboard views. This app works with Octopus Deploy 2.6+ or 3.0 beta. The modular input that allows data to be integrated from an Octopus Deploy instance. This utilises the NodeJS modular input SDK and provides the following source types. 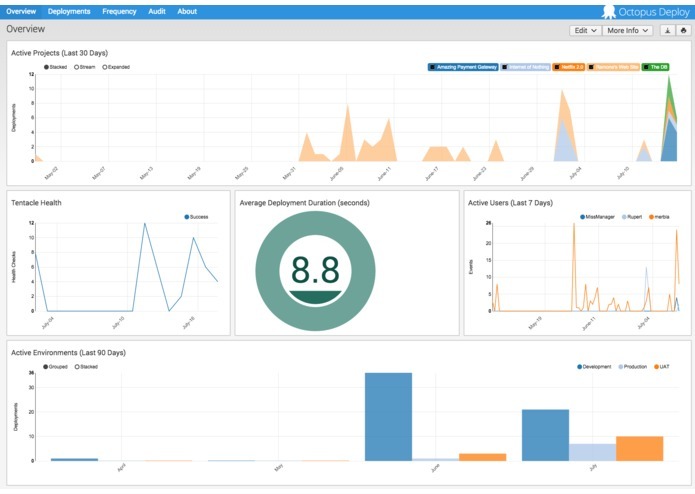 The dashboard of the app provides four distinct views of the Octopus Deploy data. This makes use of custom visualisation and saved searches. The app utilises newer versions of the D3, NVD3 libraries to those packaged with Splunk Enterprise 6.2. 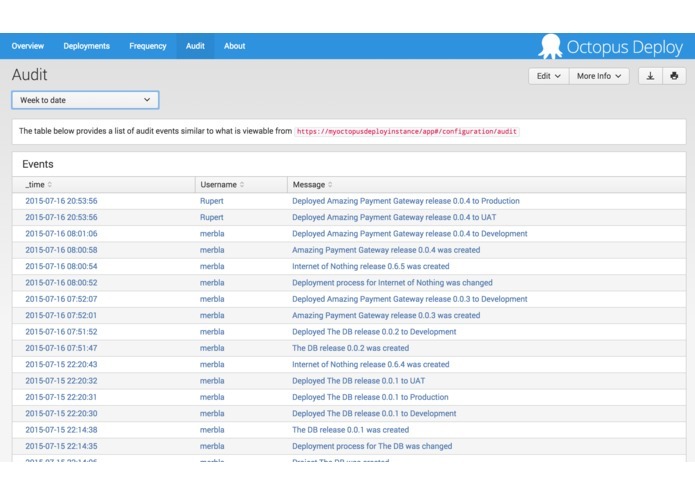 The overview provides a quick snapshot of what is happening within an Octopus Deploy instance. This includes a view of active projects, average deployment times for releases and a health check of tentacles. At a glance anyone in the organisation can understand what has moved to what environment over recent releases. The deployment view drills into the detail of deployments, highlighting problem projects with failure rates and long deployments. It also illustrates releases that have taken the longest to make their way from lower environments to production. The frequency view allows an organisation to view its deployment rate over the last twelve months. 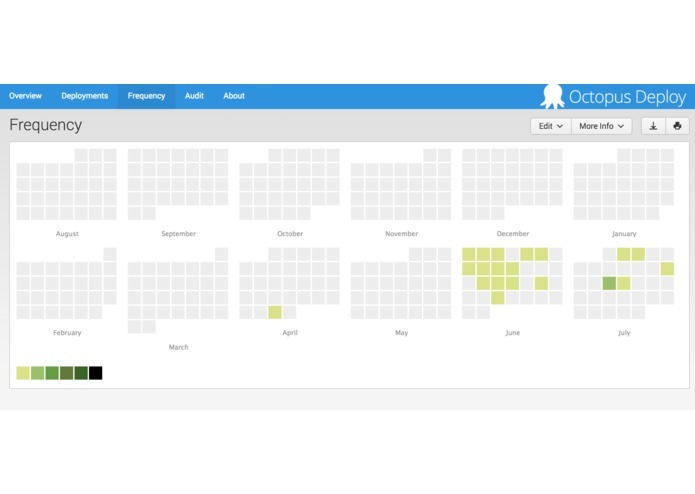 The audit view allows visibility into the tasks and significant events occuring in the Octopus Deploy instance. This is included (however not limited to) the creation of new accounts, new projects and releases. The authorised promotion of a deployment to an environment and the backups of the Octopus Deploy data. The Octopus Deploy app is fully contained (NodeJS dependencies are packaged). The app can be installed via the Manage Apps interface. Once deployed configuration occurs via a data input and its related index. An Aussie software guy that helps customers work out what parts of "The Cloud" work for their business and get those solutions to prod.